INSTEAD of clicking on computer screens, Inglewood shearer Steve Potter would rather see young people clicking shears and bringing up the tail end of a trade he fears could die out. Once upon a time, every bar you walked into in Inglewood would be full of shearers. 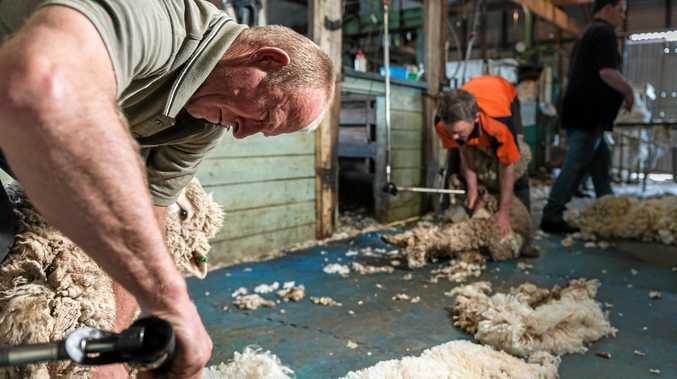 But the golden days seem to be over and the current generation of skilled shearers is concerned there will be no one to replace them once they retire. Mr Potter is concerned the trade is not clicking with the young people of today. "A lot of the young fellas don't realise what a profitable career it can be," he said. "We've really got to try to recruit some more young people to come in, because there is a shortage of young people coming along. "Once the crop of people we have now decide to retire there's sort of no one to take over. "It's a bit of a problem the industry is facing, we have actually been talking about it a lot. "All of us don't really know how we are going to get younger people into the sheds." Unlike Mr Potter, many younger generations just haven't had the exposure to shearing as those that came before them did. "I think it's just they don't really know how to do that, the manual labour, they probably have never seen it or been involved," he said. Growing up on a sheep farm in Inglewood, Mr Potter learnt the art of the trade from older shearers around the district. He said it was a rewarding career in many respects. "I enjoy the challenge of the manual labour and the camaraderie in the sheds," he said. "You shear with your mates and help your mates out too. "When you're working a big shed the camaraderie, the jokes and the mucking round make it good work." In an attempt to give shearing a bit more exposure, Mr Potter organised the inaugural speed shearing competition at the Inglewood Show last weekend. Having an intermediate class meant younger, inexperienced shearers could still have a go before progressing to the open division. "It's just to try to get people to see what we do and bring it to their attention so they might think 'I can have a go of that'," he said. "With all these barrier fences going up there are a few more sheep around so it's a good time to be getting into it."